Strava keeps sending me emails. At first I thought it was nifty. You can document the shoes that you used for your run, you know, so other people could see what you’re running in. Silly? Maybe, but I started doing it. Why thank you Strava, I have been! Thanks for noticing! 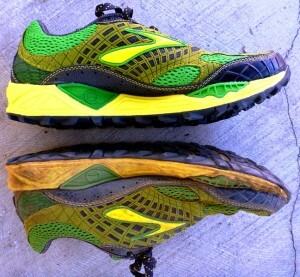 It continues, “Brooks recommends that you replace your shoes every 300-500 miles. Click here to order….” blah, blah, blah. Fantastic marketing via Strava and Brooks. Little did Strava know that I’d been wearing the same pair of Books Cascadias since the day I stepped off the Appalachian Trail in 2012. During that time I’ve run in 8 ultramarathon races, including my first 100 mile run, and hundreds of miles of training. Strava was trying to get me to buy a new pair of shoes after a mere 300 miles, while the kicks really had a good 2,000+ miles on them. Last month my new pair of Brooks Cascadias arrived in the mail. Damn marketing. In reality, it probably is time for new shoes. Not because my shoes are “wearing out” the way a shoe company wants you to think of it, but because I noticed that I am getting down to the last part of my tread. Sure, the foot bed is probably smushed into oblivion, but that doesn’t bother me. It’s just hard to try to climb up the side of a rock with no traction. So, alas, I caved and bought a new pair of shoes (new is a relative term, I scoured the internet for the exact shoes I’d been wearing and ordered a pair from eBay, cha-ching!). The shoes arrived and I compared them to my current pair of Cascadias. After almost 2 years of pounding down trails, running at least a marathon a month, and general wear and tear, they were still looking great! So great in fact that during my first 100 mile run earlier this month I actually wore my old pair of Cascadias the entire time. Strava, you can lead a horse to water but you can’t make him drink. I may have bought a new pair of shoes, but that doesn’t mean I have to wear them! So, why the Brooks Cascadia? I’m not trying to turn this into a gear review, I don’t care if you buy these or not, I don’t get paid for it. I just happen to think they are awesome shoes, for me. 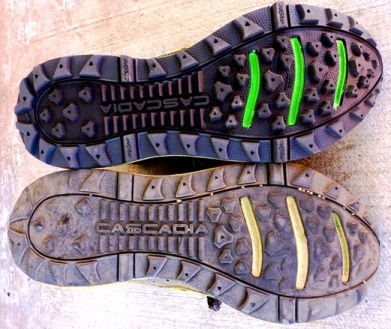 While hiking the Appalachian Trail I grew tired of my thick soled Gore-Tex boots and many of my fellow hikers were raving about the Brooks Cascadia trail running shoes. I reviewed various blogs from other hikers, all extolling the virtues of the Cascadias, so I ordered a pair. I wore them for the second half of the AT and while everyone else was replacing their shoes every few hundred miles mine stood up to the torment. I finished the AT with more than 1,000 rocky miles on the soles and returned to California to run my first ultramarathon in them before ordering a new pair, the pair I’ve been wearing since. Now transitioning to my third pair of Cascadias I can definitely say that I love them. I know people spend hours researching shoes, reading the seasonal Runners World telling us which shoe is the hot new thing, which is the best for the type of running you are doing, what drop you should have, tread for the trail, and on and on and on. Whatever. If I run on roads, I wear Cascadias. If I run on trails, I wear Casciadias. If I run on the beach I wear…nothing (if I’m going to run on the beach I want the sand between my toes). I am starting to run more in Luna Sandals too, but Cascadias are still my go to shoe. In any event, this is not a “gear review”, suggestion on what you should wear, or pitch for one thing over another. It’s just one guy, one pair of shoes, and the weird love affair between them.